When Julie’s neighbour is thrown from her house by a poltergeist witch in training Julie knows something strange is going on. She traps the spirit but then another attacks her best friend Marcus and that’s not normal. Taking the spirit to her mother the three are attacked again when an exorcism is undertaken. Investigating further it would appear that something is trying to lure Julie in, especially when a large scale paranormal assault is targeted at Julie’s high school and her mother falls into a deep coma that doctors cant understand. Julie, Marcus and her new guardian Betty have to get to the bottom of it all before its too late to save Julie’s mother. I’ve been looking forward to this one for quite a while now. I’d heard brilliant things on other blogs, seen great ratings on goodreads and from the sound of the blurb I knew it would be a must read. Poltergeeks came highly recommended and it had a lot to live up to for what I had in my mind, unfortunately it didn’t quite live up to what I expected but it was still great. The story was an interesting one. It throws you straight into the action with Mrs Gilbert and the poltergeist and you don’t have much introduction to Julie’s world, but it works really well. You start gathering the background as the story goes on and I often prefer this method to a lot of start up introduction because you are experiencing the world as you learn about it. The witch thing was obviously an integral part of the story and the fact that Julie was still only in training was very important. I loved that there were elements of romance, family life and friendship within the story and it wasn’t all spirits and witchcraft and they really helped build the story up well. It was really interesting to find out about the witchcraft side of things though and I loved the idea that everyone has the ability to perform magic, but others like Julie and her Mother can hone in on it better. The main reason for me not enjoying the book however was the fact that I saw the major twists at the end of the book way before they happened. They weren’t twists at all for me and that really put a dampener on my enjoyment of it. The characters were really good and I loved each and every one of the main ones. Julie was really awesome and I loved her no crap attitude, she did come across as a little selfish and childish at times but to be perfectly honest, what 15 year old doesn’t. However Marla was more selfish and self absorbed so that really took the traits away from Julie. Marcus was a great best friend and I loved the little sense of romance going on there, I could tell he really cared for Julie and her mum and he was such a cleaver, geeky guy I couldn’t help but love him. Betty was amusing but I was a bit wary of her at first and Julie’s mum was such a strong character she was seriously missed while she was in the coma. Unfortunately if I shared my favourite character with you it would seriously spoil the storyline but they deserve a shout out anyway! I did enjoy Poltergeeks but my high expectations meant that the end result didn’t quite hit the spots that I wanted it too. I think the writing was a little off putting too and although I really love first person narratives Julie’s strong opinions and way of speaking was distracting at times. I also got really annoyed by something which was so little that it is barely worth mentioning but it threw me off that Marla was almost always referred to by her full name, Marla Lavik, I didn’t understand why at all and it jarred really harshly with me, even though its such a small thing. It was only small things that meant I didn’t enjoy Poltergeeks as much as I’d hoped and even though I saw the twists coming I still really enjoyed the story and its development. The humour in it is brilliant and the storyline can be so, so interesting that its still definitely worth a read. 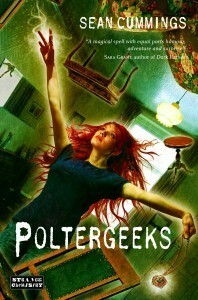 Poltergeeks will be published on October 4th by newish YA publishers Strange Chemistry. My copy was sent from the publisher in exchange for an honest review. Aw shame you didn’t love it as much as I did. But I seem to have a habit of not noticing things lately in books, I think I might read too fast. The thing I loved most about Poltergeeks was the realistic relationship between Julie and her mother. I think that Sean really nailed the conflicting love-hate, independence-dependent nature of a teen, establishing her identity and a mother trying to protect her daughter.